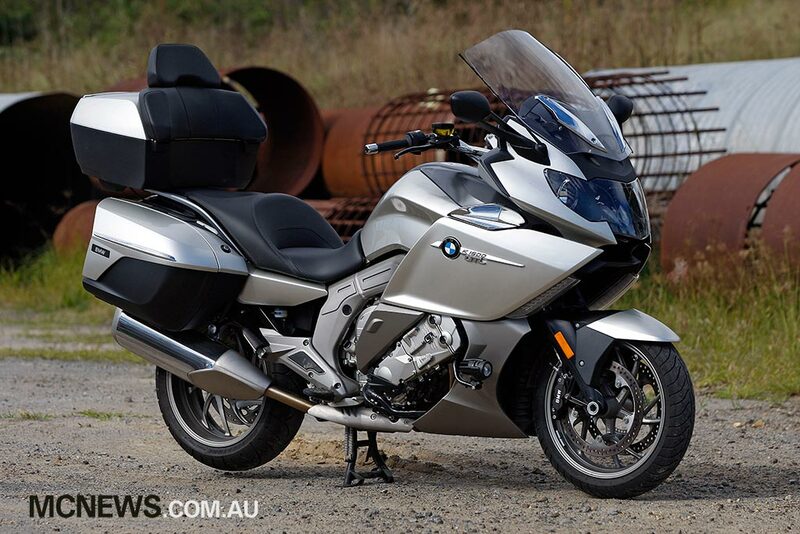 BMW’s latest attempt at a new game changing model arrived in Australia this month (June 2011) with the new BMW K 1600 GT and BMW K 1600 GTL set to take the heavyweight touring market by storm. These powerful new machines are lighter than comparable motorcycles, offer exceptional handling for their category and bristle with well-executed features that help to establish a new level in touring motorcycles. A highlight of both models is the shared new six-cylinder engine. BMW’s track record with such engines in the automotive world is unparalleled and not surprisingly, this new donk is a beauty. In fact, this 1649cc of BMW brilliance completely annihilates any comparable motorcycle in relation to power and torque, from idle right through to the 8500 rev-limiter. There are only three engine configurations that provide inherently perfect balance: the straight-six, flat-six and V-12. It shows, as this long-stroke BMW straight-six is simply a marvel. At 103kg complete with gearbox, alternator and clutch and only 56cm in width it is a triumph of engineering. Numbers don’t do it justice. BMW claim 158hp at 7750rpm, not an overwhelmingly impressive number for a motorcycle that registers more than 300kg on the scales. The standout figures are the huge 175Nm of torque at 5250rpm, and over 130Nm of twist from as low as 1500rpm. Most competitors have been neutering the bottom end torque of their bikes in recent times, presumably to extend gearbox and final drive longevity. BMW, however, give you all the Clydesdale-sized horses with a double shot of Viagra to boot. Only the larger capacity Gold Wing can offer comparable torque smooth enough to use down low, but it’s no match for the BMW when the revs rise. As for BMW’s other top-spec tourer, the R 1200 RT, the K 1600 machines have more torque at idle than the much loved Boxer can muster anywhere in their rev range. Between 4000 and 7500rpm is the motor’s sweet spot. Tall gearing sees the mill turning only 3000rpm at 110km/h and even its prodigious torque can’t overcome that handicap when urgent overtaking moves are called for and a downshift or two is required for truly rapid acceleration. It is certainly not lazy in the lower gears, it power wheelies in first gear with little provocation. In rain mode, full top-end power is available but throttle response is dulled and the torque curve flattened through the mid-range. Road and dynamic both offer the same power characteristics while dynamic sharpens throttle response a little too much for comfortable progress. Road is my preferred mode. It even sounds pretty damn good. The politically correct fun police from BMW HQ dictated that we were not able to sample a machine equipped with the optional Akrapovic mufflers. Personally, I think they should be prosecuted for cruelty to journalists. Whilst the tall gearing no doubt helps fuel economy and highway relaxation, it can also lead you into ‘lose your licence’ territory quick smart. The GTL is electronically speed limited to 220km/h while the GT is allowed 30km/h more for the magistrate to consider. In town or on the highway, the six-speed gearbox seems to offer a few more ratios than required. Often I just clicked through a few gears at a time as for smooth and legal progress, regardless of which cog was selected. Even letting the tachometer dip below 1000rpm in fifth gear doesn’t see the 1600 grumble. From a standstill the take-up point on the light clutch is hard to judge, although with time no doubt familiarity would render this a non-issue. The 10-plate wet clutch is also of the slipper variety, helping to negate any unruly sensations from the rear when dropping down too many cogs under brakes. 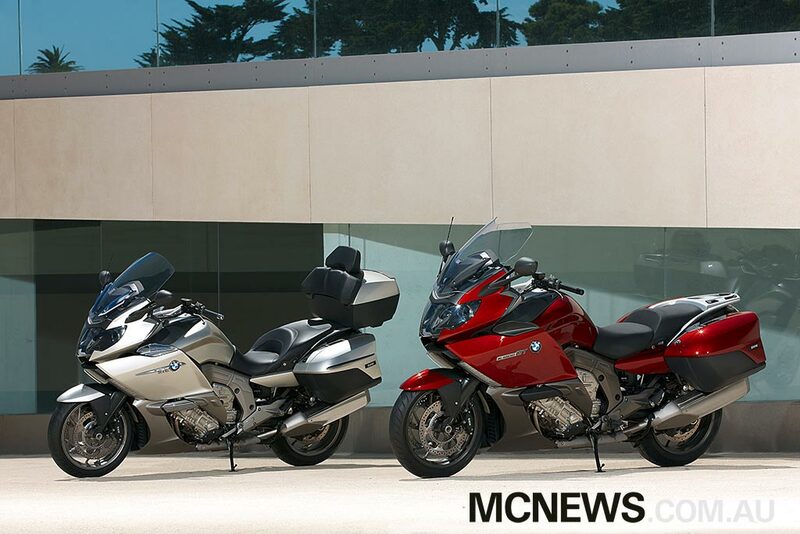 BMW’s duolever front end is a match made in heaven for big motorcycles. Inherently resistant to pitch changes brought on by accelerative or braking forces, the duolever front suspension helps rider confidence and reduces the chronic front tyre wear common to large machines suspended by conventional forks. The Paralever rear suspension combines the swingarm, Cardan shaft drive and rear braking system, all into one single-sided unit. Once off the sidestand and rolling, the K 1600 machines offer almost ridiculously light steering and excellent foot-peg initiated manoeuvrability. With its 800mm seat height and 15kg less pork to carry, the GT is noticeably more agile and offers excellent ground clearance, making it well suited to aggressive riding in the hills. Due to a 50mm lower seat height, the GTL does give away a fair bit of ground clearance to the spritelier GT but it still takes a mid-corner bump at lean in order for the pegs to touch down. The wheelbase, trail, rake and total width are identical while the GTL allows for a load of 221kg, 9kg more than the GT. The GTL does feel a little more vague once the speeds rise compared to the tauter GT but again, it’s still superior to the other full dress tourers on the market. It’s just that the GT is certainly more aggressive. In tight terrain it won’t be left behind by the much lighter R 1200 RT, perhaps the boxer is still a more satisfyingly sporty ride but when it comes to firing out the other side of a turn the boxer feels virtually breathless in comparison to the new big kid on the block. Thanks to the standard fitment of second-generation electronic suspension adjustment both rebound damping and preload can be adjusted from the bars to suit the prevailing conditions or mood, offering a sweet ride no matter what the terrain. Damping changes are enacted on the fly while the machine must be stationary for the spring base change to be applied. Having set up changes at your fingertips ensures that it is a fuss-free process to adjust the machine and preserve correct chassis geometry for differing loads, while also changing damping rates to ensure stability, comfort and performance in any role. No piddling about with c-spanners, knobs or screwdrivers here – it’s all done without lifting a hand from the bars. Bloody brilliant. Adaptive headlight technology has been adapted from cars and implemented on a motorcycle for the first time. A gyroscopically-controlled and centrally-located Xenon headlight stabilises the beam vertically to compensate for pitch changes through the suspension and swivels the beam of light to the direction of travel while negotiating a corner. The systems works as advertised but I was a little disappointed with the resulting output. Perhaps my unfamiliarity with the temperature of lighting provided by a xenon beam disconcerted me a little. I know though I am more susceptible than most to unnatural light as I can’t wear a tinted visor no matter what the conditions and also dislike sunglasses. When supported by the two high-beams situated either side of the main beam I found the lighting more than satisfactory. A row of LED driving lights flanks the leading edge of both fairing panels and is more for aesthetics than practicality. Ergonomically, both bikes are comfortable with the GT rider angled towards the front for a more aggressive riding stance, while the GTL is very upright and has a slightly larger screen. The seats are expansive on both, although by the end of the day, my cheeks started to get a little tender. Both machines come with functional panniers that are easily removed while the GTL also scores a voluminous top-box with backrest and internal lighting as standard kit along with fog-lights. Both bikes are equipped with tyre pressure warning systems, central locking (don’t laugh it’s very handy for the luggage and compartments) along with heated seats and grips, both adjustable through five heat settings. An excellent iPod-compatible stereo system with Bluetooth is also standard on both models, as is an alarm system and pre-installed interface for the excellent optional GPS system that slots into the top of the instrument panel. Everything can be controlled from the bars with a high-resolution TFT screen utilised for toggling through the myriad menus that control the huge amount of settings available, to tailor the ride to your preferences on the fly. The speedo and tachometer side of the instrumentation is nothing special and with the speedometer graduated through from 0 through to 260km/h in 20km/h increments means straying above the speed limit is extremely easy. I prefer a large LCD to display the speed in these go directly to jail, do not pass go, do not collect $200, guilty until proven innocent farcical misappropriation of the legal system masquerading as road safety that we serfs have to put with. Best to use the standard fitment cruise control on those potentially licence-losing highway stretches. The GTL has a 26.5 litre fuel capacity, 2.5l more than the GT and fully fuelled the GT undercuts the GTL by 29kg to hit the scales at 319kg ready to roll. This makes the K 1600 GT 31kg heavier than the outgoing K 1300 GT that has now been dropped from the BMW line-up. The 1300 was also quite a powerhouse but was underdone in the feature stakes compared to the new 1600 machines or the fully-featured R 1200 RT. The K 1600 GT feels more agile and shrugs off road irregularities with much more composure than I remember the 1300 managing, and certainly feels a generation ahead of the previous machine, as it should. The K 1600 GT has entered the market at $34,990 plus on roads and the GTL registers at $36,990. They are not cheap but the Australian specification machines are fully loaded with all the kit that are largely only available as optional extras in other markets. The GTL is available in silver or dark blue and the GT comes in either a light grey (looks better than the name suggests) or a dark metallic red.